"In the last five years, the College of Arts has engaged with over 400 organisations from the Private and Public sectors, worldwide. These partnerships have encompassed a range of activities including student internships, sponsored postgraduate scholarships, continued professional development and, of course, contract and/or collaborative research" (from the website of the Arts KE Industry Day 2013). In an age of scarce public investment in the Arts and Humanities these initiatives actually constitute the possibility for many researchers to experiment new research directions aiming at a wider impact beyond the academic community. For Universities, Knowledge Exchange (KE) programmes offer also a novel meter to measure their prestige against both their attractiveness for investments and their influence on the general public. 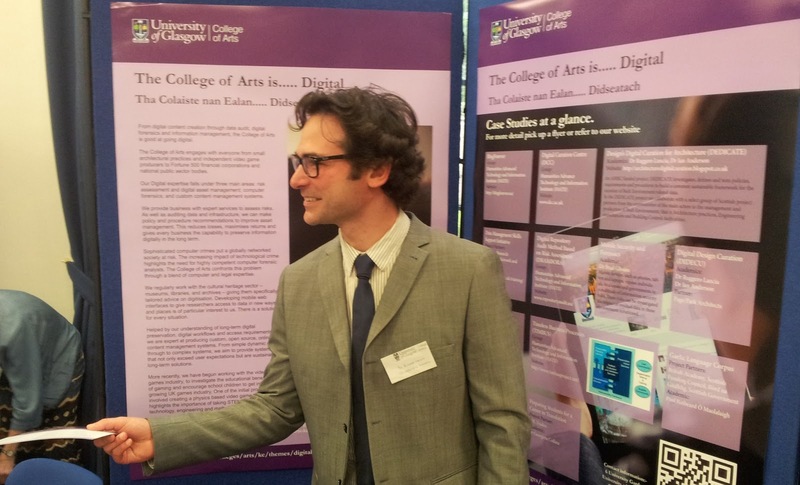 On the 31st of May, the College of Art of the University of Glasgow celebrated its first KE Industry Day presenting case studies introduced by experts from the Arts, Cultural and Creative sectors. In this occasion, the case studies have been split in 8 thematic groups: Cultural Education, Digital, Dress & Textiles, Film & Broadcasting, Heritage, Performing Arts, Visual Arts, Writing & Publishing. 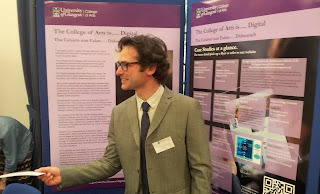 I have been invited to present for the Digital Theme, DEDICATE and the Design Digital Curation (DIDECU) KE project, a previous research I co-investigated with Dr Ian Anderson, between 2010 and 2011. Both projects received great interest from the event's audience and I believe proved the quality of the knowledge base built at the HATII in recent years on the curation of Built Environment related data. I am particularly proud these projects have been featured together with renown Digital Curation initiatives such as the Digital Repository Audit Method Based on Risk Assessment (DRAMBORA) and the Digital Curation Centre. Matthew Barr from the HATII, who was presenting different projects at the Heritage stand, graciously took a picture of me while eagerly passing one of the projects flyers to the Design stand visitors. I would like to take advantage of this post to thank Dr Fraser Rowan for the organisation and moderation of this important occasion for demonstrating the excellence at the University of Glasgow.